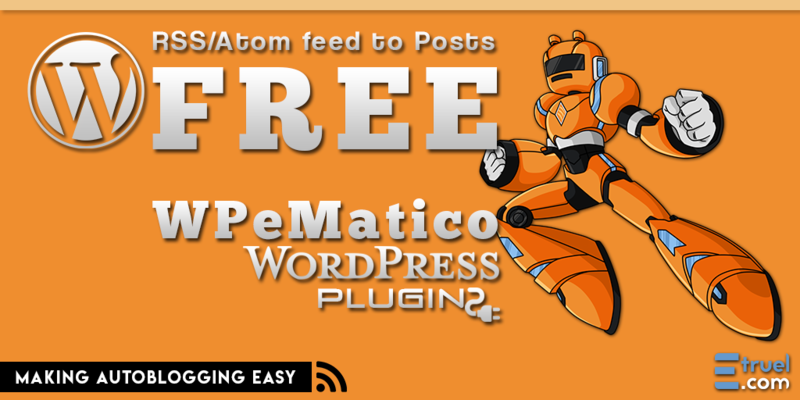 WPeMatico is a very easy to use autoblogging plugin. Organized into campaigns, it publishes your posts automatically from the RSS/Atom and XML feeds of your choice. For XML and RSS fetching, it uses the Simplepie library included in WordPress or forces to use the external library included in the plugin. As for image processing, it uses the core functions of WordPress. Failing doing the latter, it will use the custom functions with or without cURL. You can submit any bug in the bugtracker. Campaigns Feeds and options are organized into campaigns. Comfortable interface like Worpress posts editing for every campaign. Multiple feeds / categories / tags. Auto add categories from source posts. From 2.2v also supports for XML feeds or files by uploading them into WordPress Media lib. Unix cron and WordPress cron jobs. For maximum performance, you can make the RSS fetching process be called by an external cron job, or simply let WordPress handle it. Options to set max items per fetch, comments on or off, sets authors and a lot of more options. It allows to publish to any public WordPress Custom post type, status and post formats. Images caching are integrated with WordPress Media Library. The first (or 2nd or 3rd, you choose) image attached to a post can be marked as the Featured Image. It is possible to upload & attach only the featured image ignoring the others. You can choose whether to upload images as post attachments or not. Also upload remote images or link to source. Fully configurable. You can choose whether to upload audio and video files as post attachments or not. Also upload remote files or link to source. Fully configurable. Words or phrases rewriting. Regular expressions supported. Words Relinking. Define custom links for the words or phrases you specify. Words to Category. Define custom words to search into content or title to assign every post to specified category. Detailed Log sending to custom e-mail. On every executed cron or only on errors with a campaign. Option to replace title links (Permalinks) to point to the source site. Can copy the slug from original permalink for better SEO. Post templating before save. Can include Galleries, link to the sources or any text you want. Dashboard Widget with campaigns summary. Option to choose what roles can see the dashboard widget. With lots of amazing and professional features to work with images and content parsers/filters. Extends WPeMatico with a lot of advanced functions and a lot of new features to parse and filter feed items contents, filters for featured, media, enclosure and in-content images, automatic tags generation, inserts custom fields with every post and much more. Synchronizer allows you to keep updated the posts obtained, the synchronization process analyzes the content of the feed items and compares them with the post, if different it will be updated, including media files, authors, categories and tags. Takes the title and permalink and scratches its web page to find the full content with option to search for multi-page articles. Set the featured image from meta tags of source web page, Open Graph or Twitter images. Works automatically with 95% of the websites, but if not, allows set up a configuration file for every domain pointing to what section of the web page must be obtained. Manual Fetching is the perfect complement for the Campaign Preview feature of WPeMatico. Extends its functionality to every feed individually and allows you to review and insert each item, one by one or in bulk mode with just a click in a button. You’ll see the items that will be extracted but already parsed like will be published as posts with their images, audio and even videos. Polyglot lets you translate the posts obtained from remote feeds before inserting them in your WordPress blog. It can work with any other extension and translate after processing the content. Just select the original language of articles in a WPeMatico campaign so you can translate to one of the 107 supported languages. Create your custom feeds RSS 2.0 with content from external sites in your WordPress blog, regardless of whether or not those have their own feed. It follows the standards of WordPress editing and code. If you know how to upload a post in WordPress, this is even easier. It is the perfect complement for WPeMatico together with the Full Content addon to indicate to extract the full contents and place it on each item in the feed. If the Full Content addon is not installed, anyway will get the permanent links with the titles of the main page. Uses the WPeMatico campaign data to obtain the content from Facebook to be published automatically. You can import from all pages/groups as you want, just adding one WPeMatico campaign per facebook page/group. Also imports the images in big size, allows import the comments in facebook with the names of the commenters to every imported post and many more features. Makes excerpts with first post content sentence and other filters. Sets nice and better excerpts in front-end and also in feed contents. Can be used to save the excerpts just for new posts of WPeMatico campaigns or to parse the excerpts of all posts of your site when shows them in your front-end page. Very useful addon that allows publishing remotely by WordPress Post via email, Jetpack Post by Email feature or plugins like Postie. Sends the fetched posts to an email account. Each campaign allows send the posts to a different email account. As it sends the contents to an email account, allows to publish contents automatically through an email account from your WordPress with WPeMatico to any third party or Content Management Services that can reads emails. A powerful single plugin or WPeMatico addon, which optimizes the websites speed thanks to processes and technologies that reduces the overload of the websites where it is installed. Improving the velocity till 10x comparing with with other cache plugins for WordPress. See the Requirements. Ask for any problem you may have and you’ll get support for free. 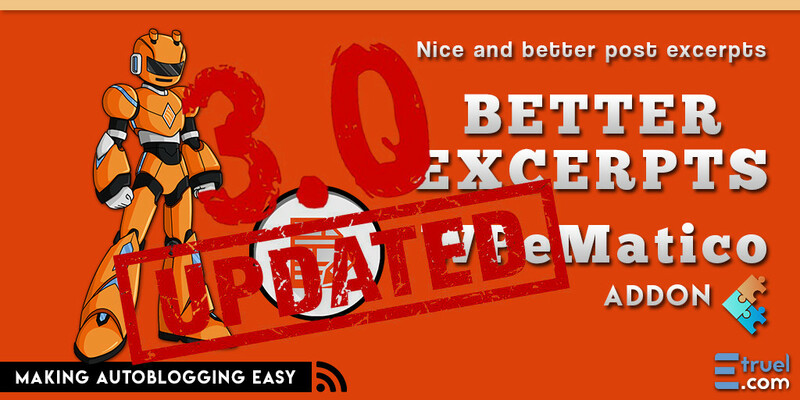 If it is necessay we will see into your website to solve your issue. Get access to in-depth setup assistance. Whatever the issue is, we will dig in and do our absolute best to resolve issues for you. We will even log directly into your site to find the problems. You can rest assured knowing that we are going to find an answer, no matter how long it takes. Includes the editing for a config file for one website for Full Content Add-on. You can see all the requirements details in the System Status tab inside WPeMatico Settings screen. Don’t hesitate to give your feedback. It will help making the plugin better. Other contributions (such as new translations or helping other users on the support forum) are welcome !